The goal of today is to make the prey more animal-like, concerning both the head-movement of the prey but also in accordance to [Bibliography item krink not found.]. Finish the construction of the prey robot. Figure out a solution for the back wheel. Mount the cables for the sensors and motors. Build the other three prey robots and see them interact. Experiment with the head turning. Implement an InternalState class for the prey, containing information about sleep, hunger and so on [Bibliography item krink not found.]. There may still be modifications to the robot, but there should be a working solution for the back wheel, that allows it to turn 360 degrees without the wheel sticking out (which makes the robot look less like an animal). The first try was having only one wheel and have the wheel stick out a bit, but the wheel was only able to move 180 degrees, and it looks less like an animal seeing that the wheel looks like it is attached to the robot and not like it is a part of the robot. The second try was was doing it the simple way that had worked before, having two wheels (see picture). since the wheel is more directly under the robot this comes at the price of some of the stability. 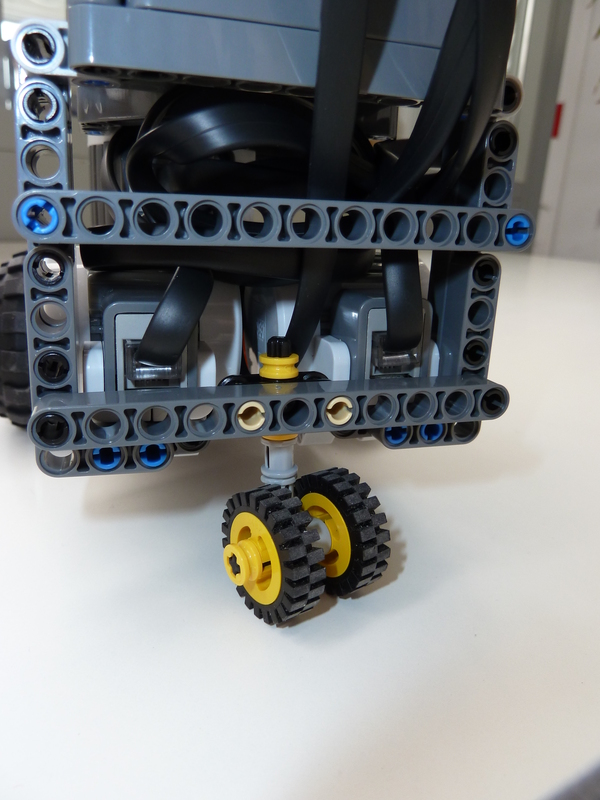 The cables for the motors and the sensors should be mounted which will introduce some foreseen problems, since the head of the robot has to be able to move, and cables for some moving part will always be a challenge. Attaching the cables and using cable strips solved the problem (so far). Sorting the new boxes and building the additional prey robots was done with much childish joy. The idea behind the head turning was that the prey is able to turn its head to either side, to make the sensors have a wider range, and make the robot look more animal like. The major issue with rotating the head is that the cables are non-flexible which raises a concern if this is at all possible. It turns out that using longer cables reduces the problem. To implement the movement of the head the NXTRegulatedMotor [Bibliography item regulatedmotor not found.] with RotateTo is used. In the Mover the HeadTurner class is used, so that whenever the robot is moving forward or backwards it is looking the way it is moving. This might have some implications since some of the previous implementation might have assumed that the robot is looking straight ahead. The first design idea for the predator is to make it look - more og less - like a scorpion. The motor has problems lifting a long and heavy scorpion tail, so the design has to be remade. We did not have time to implement the InternalState and we push this to the next session. The head moving should be used in more behaviors than the wanderer. Perhaps the prey should sometimes stand still and turn its head to use the extra range of the sensors. At some point the different behaviors should be properly documented as well as most of the code.